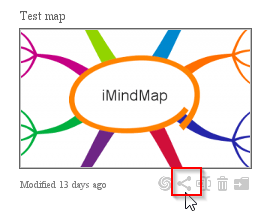 To add contacts and share your maps, you will need to ensure that you have registered an iMindMap user account, and that you have signed in. Sign in to Cloud and Mobile. Your desktop and user account will now be connected. 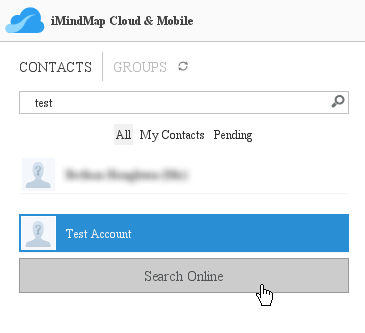 Search your contact's username by entering it into the search box and clicking the magnifying glass icon. Hover over your contact and select the '+' icon and then press yes. Your contact will then receive a notification to accept your request. Next to your contact's name, you will see 3 icons - a share icon, eye and pencil. Select the pencil icon next to your contact's name and select OK.
You will now have successfully shared your map with your chosen contact. Please note: You can both work on the map at the same time but changes to your map will not be viewed in real time. To view changes that you have both made, you will need to save the map and then close it. When you re-open it, you will see the changes. Please note: Users cannot work on the same map together in real time. If two people are working on a map at the same time and both save and exit, it may cause a conflict error, losing some of the updates you have made. Does iMindMap Cloud work with iMindMap on my desktop?